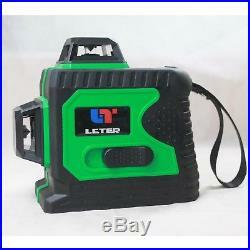 The LETER 3D laser level is a compact, practical option for basic cross line leveling work. Measuring at 1/4 , the laser can fit comfortably in the palm of your hand. It has a hard plastic housing to protect the laser beams and pendulum leveling system within. The housing has a ribbed rubber casing that protects it from scratches while giving extra friction to make it slip resistant. Water resistant grade IP54. 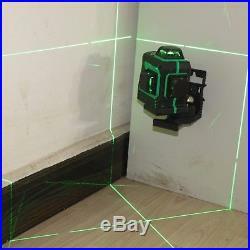 The 3D laser is a cross line laser level. This unit is self-leveling with accuracy range of within ± 4 °. 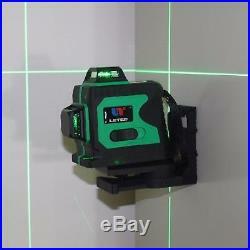 Working range of this laser is up to 65 (20m), depending on the work areas illumination. The two separate line beams are generated from 635nm laser diodes. The line beams have ±2.2mm accuracy at up to 10m. The laser level has three laser windows, each window can launch 4 laser lines, totally 12 laser lines(4 laser lines combine to a plane). Attention: There are at least 4 laser lines, it can not keep 1 or 2 laser lines. The difference between the green laser and the red laser. They are from the same factory, the function is same. The green laser’s visibility is four times of the red laser, it’s material costing is higher than red laser, and is more expensive than red laser. Our factory does not set up this kind of laser level receiver, this laser level is powerful, we haven’t find the most suitable receiver yet. The working range of this laser is up to 20m, depending on the work areas illumination. The 3D laser level is a compact, practical option for basic cross line leveling work. The 3D laser level has one mounting nut with a 1/4 thread at the bottom of the unit. This allows you to mount it either to a bracket or a tripod for security. The unit can be placed on a regular surface, but securing it usually guarantees less movement for more accurate work. Once the pendulum is in unlocked condition, the instrument will be self-leveling within 4’when the unit is using out of the leveling range, laser lines and main indicator will keep flashing. 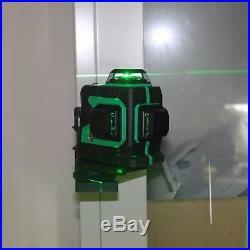 Powerful laser line, before use it, do not look directly into the laser, switch lock, protect children. The green brightness of the laser light is very strong, it will produce projection or Stray light in the mirror or plane. 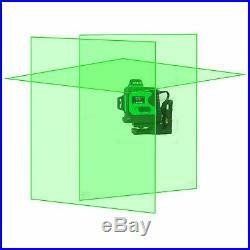 All 3D green laser can not solve this problem. Waterproof grade: IP: 54. Over-all accuracy: ± 2.2mm / 10m. Orthotropic accuracy: 90° ± 30. Leveling range: ± 4 °. Line-width: 2mm / 10m. Working range (Radius): 20m. Power supply: With Andrews charging port 4000MA lithium battery. Working time: up to 4.5 Hrs. WARNING: Powerful laser line, before use it, do not look directly into the laser, switch lock, protect children from device. Please mind : This laser level can not lock the laser line when you use it tilt (“slope” function), the laser line will flash slowly. 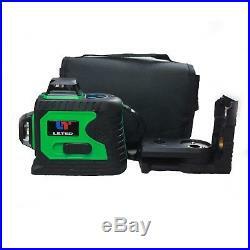 1 x 3D Green Line Laser level (With Andrews charging port 4000MA lithium battery). 1 x L Stand. 1 x Cloth Bag. Note: This package does not include tripod or batteries. 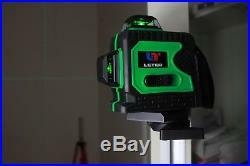 The item “3d Self Leveling Green Laser Level 360 Degree 12 Lines Horizontal&Vertical Cross” is in sale since Sunday, April 8, 2018. 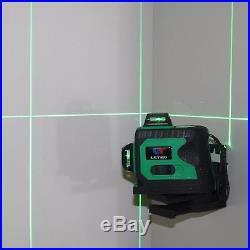 This item is in the category “Business, Office & Industrial\Hand Tools\Measuring Tools\Laser Measurers”. The seller is “zykykj126″ and is located in HONGKONG. This item can be shipped worldwide.